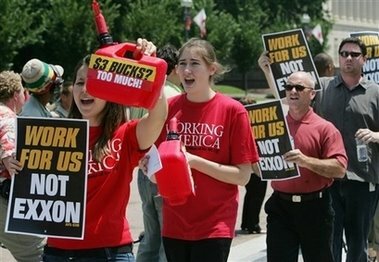 Strange… a group from the AFL-CIO protesting high gas prices got lost and ended up at the White House today. What their democratic union leaders are not telling them is that those democrats they keep giving money to, again voted to block oil drilling off the US coastline today. This of course means no new union jobs, higher gas prices and greater foreign oil dependency! And, despite the global oil crisis, this is the third time in little over a month that the House Democrats voted against drilling in the United States! The House bill would end an Outer Continental Shelf drilling moratorium that Congress has renewed every year since 1981. It covers 85 percent of the country’s coastal waters — everywhere except the central and western Gulf of Mexico and some areas off Alaska. Today the House voted (Roll Call vote 356) on the Bobby Jindal (R-LA) sponsored bill, HR 4761 that would “provide for exploration, development, and production activities for mineral resources on the outer Continental Shelf, and for other purposes.” Once again democrats opposed the drilling and exploration. However, the bill ended up passing through the House because of the Republican majority. The bill passed 232-187. 192 Republicans voted in favor for the bill. 155 Democrats opposed drilling for oil again for the third time in a little over one month. 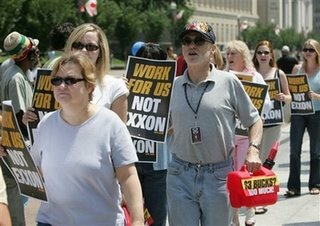 ** Democrats refuse to allow US companies to drill for oil off the US coastline although China and Cuba with their horrible environmental records are now finalizing plans to drill for oil within 90 miles of the United States. That’s OK, the democrats will just dupe their voters into thinking it’s all George W. Bush’s fault. It has worked pretty good so far!